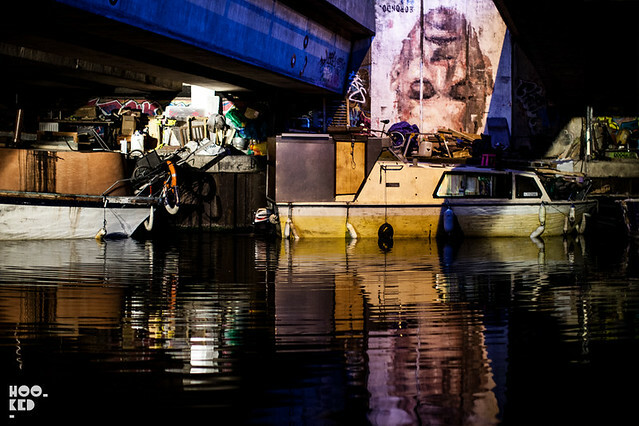 Over the weekend Hookedblog finally found some time to visit the new mural aptly titled 'Narcissus' from Spanish artist Borondo created earlier in February along the canal in Hackney Wick, London. We managed to photograph the impressive portrait piece painted upside-down and reflect the right way up in the slow moving waters as the evening light was fading. The atmospheric light gave the piece a completly different feel to when viewed during the day, what with the overhead motorway bridge casting shadows which framed the piece nicely. The young artist has been very active the last number of weeks having already painted / scratched a number of pieces around Shoreditch, Camden, Brick Lane as well as collaboration with JAZ on the Foundry gates in Old Street (covered here). Borondo has extended his stay in London so be sure and keep an eye on the empty shop units around Shoreditch, we expect we will be seeing more from him soon. Check out the time-lapse video below shot by Fabian Caputo featuring Borondo creating the above piece. Nice piece, plus what is the music overlaying the video? Thanks, its a bit Stereolabby. incredible, if only i could create something this great even the right way up! which canal is this in hackney, and which part? i'd love to see it in person.